British musicians claim to have set the world record by playing a gig at the world's highest altitude - above Mount Everest's Base Camp. 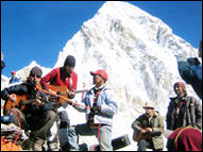 The artists, from five separate bands, said they performed at 5,545m at Kalar Pattar last month. The 40-minute concert, in front of about 100 mountaineers, was to raise money for children victimised by armed conflict in Nepal. Musician Oz Bayldon of The Hidden said it was a wonderful experience. The Everest gig was organised by British charity The Nepal Balabalika Trust (Trust for Nepalese Children). The musicians who played also included Martin Harley of The Martin Harley Band, and solo artists Ben Michaels, Michael 'Skyhook', Billy Page, Mike McGuiness and Nick Storey, said trust member Jason Merry. Another group of musicians performing for the charity had already set another world record of longest gig in September this year by performing continuously for almost 44 hours in a bar in London's Soho district. Mr Bayldon said they had raised almost £30,000 overall to help Nepalese children. He said a shelter and skills centre will be set up for the conflict-affected children at Dhulikhel, east of capital Kathmandu, with the help of another charity, Help Nepal Network. Rights groups say almost 400 children have died in the nine-year-old armed conflict in Nepal. They say thousands of others have been displaced, along with their parents, as the conflict intensifies. More than 11,000 people have lost their lives in the insurgency which aims to replace the country's monarchy with a Maoist republic.